Famed Canadian director David Cronenberg's last three movies have one thing in common they all feature "Lord of the Rings" star Viggo Mortensen. These movies are "A History of Violence (2005)", "Eastern Promises (2007)", and "A Dangerous Method (2011)". Their collaborations have made Cronenberg's films more widely accessible to mainstream audiences, while also bringing strong critical praise. Each of these films will be reviewed in the coming weeks in the Rockport Review. I have also previously reviewed a number of Cronenberg's earlier films such as "Rabid", "Scanners", "Dead Ringers", and "The Fly". "A History of Violence" is based on the graphic novel by John Wagner and Vince Locke. Screenwriter Josh Olson was nominated for an Academy Award for his job in adapting it for the screen. This is the story of a small town man named Tom Stall (Mortensen) who owns the local diner. One night he skillfully dispatches a couple of thugs who try to rob the place. He then becomes an overnight media sensation while also inadvertently bringing his dark and buried past to the surface. Tom lives the classic American small town life, he is married to Edie, played by Maria Bello. Together they have a teenage son and a younger daughter. Tom and Edie have a strong loving relationship, but when a group of tough guys from Philly comes to town, they not only threaten Tom's marriage but his life. 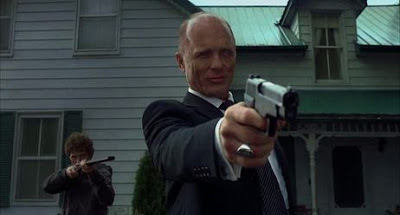 Ed Harris plays Carl Fogarty a made man from the Philly mob who visits Tom's Diner. He has a nasty scar where his left eye used to be and is quite intense and menacing. He calls Tom by his supposed former name "Joey, Joey Cusack". With Edie at his side, Tom is confounded and insists he has the wrong guy. Fogarty talks to him like they are an old friend and his words have a truthful intensity to them. Local Sheriff and friend Sam looks into Fogarty's background and confirms everything Tom suspected. These are dangerous and violent people. When Fogarty stalks Tom's wife and daughter at the local mall and tells of her husbands shady past, Edie starts to freak out. Uneasy times consume the Stall family; who is their husband and father anyway? Are Fogarty's accusations true? Things come to a head and an intense confrontation in the Stalls front yard ensues. Tom has no choice but to protect his family at all costs, but his son Jack seems to be following in his father's violent footsteps. Tom realizes he needs to put "Joey Cusack" to sleep for good so he goes to visit his high ranking mob brother Ritchie at his Suburban Philadelphia mansion. Ritchie Cusack is played by William Hurt who was surprisingly nominated for a Best Supporting Actor Oscar for his 10 minutes of screen time. Tom/Joey and Ritchie have little brotherly love for one another as they confront each other one last time. This movie is skillfully acted and well put together. 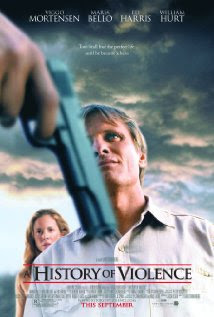 Viggo Mortensen is known for really inhabiting the characters he portrays and doesn't disappoint here. David Cronenberg got his start in horror films and has been known for his kind of bizarre bodily violence, something that is readily apparent in a number of scenes in "History". Check out the DVD/Blu-Ray if possible it has a bunch of special features.